Gone are the days when people were managing all the things manually in a business. Today, everything is going digital, and with this technology evolution, every industry is adopting different software for controlling various functions automatically without putting much effort. Same is the case with the restaurant industry as this domain is also evolving with the adoption of advanced POS software for better and swift executions of different processes. The Restaurant POS software is the essential part of a restaurant that manages different operations like the billing, invoicing and tax management. This system not only takes care of the complex daily restaurant activities but also provides various data for holistic restaurant solutions, for example, CRM management system, insights, analytics and much more. Forget about the days when you were depending on the large and bulky hardware which was using too much space. However, with the introduction of POS restaurant software, everything has become easy like the hardware doesn’t require full space and dependency. POS can be work on types of operating system, and it comes on all the portable devices like phone or tablet. The POS system helps to take orders on tabs from the customers who provide them easy ways to recommend the hottest menu list or what is most popular among the other customers. The POS software helps to manage the whole food ordering and placing process more efficient and fast. By installing the POS software in your device, you do not have to be present in your restaurant to handle different processes. You can make online changes using the POS software anytime and from anywhere. With the installation of cloud POS system, there is no need for any significant investment as the cloud restaurant POS software comes with a subscription payment model. In that case, you can pay on a monthly basis, and if you are not happy with this service, then you can sign out the service. No need to worry for going out of the date as the software makes regular online updates automatically when needed. POS for restaurants comes with high security and high storage space. There is no need to take tension of data lost or any other third-party or unauthorized access issue. POS software is highly safe to install and manage your restaurant operations smoothly and safely. The best part of the cloud restaurant POS software is that it can also work in offline mode and the whole data gets auto-saved when the internet is restored. A self-service kiosk is the next-generation restaurant trend which is going to explode in the coming years. Restaurant self-service is the growing trend that customers are loving and finding it easy to place their order in restaurants. With this approach, you can avoid the hectic process of standing in the queues and waiting for your turn to order the food. Self-service kiosks consist of a digital menu, easy buttons, self-service modules that remove the human interaction process. Kiosks are rapid to machine learning and provide you with all the numbers that are required to keep safe like the hottest item, today’s specialty and more such that helps in improving customer experience. With the use of best restaurant POS, customers can place different orders from their tablets. Just imagine you are sitting at a restaurant and want to order some food. In that case, you need to wave your arms frantically to call a waiter, but with the help of cloud restaurant POS system, you can order anything just by one click and sitting at your place. Facial recognition is one of the top restaurant trends that will get massive demand in 2019. Some instant service restaurants are making the use of biometric facial recognition. For this, you have to smile by seeing the camera and the software will present your all the details on the screen. The restaurant will recognize you with all your past orders, loyalty points and so on. With facial recognition, you can keep the whole restaurant and customer experience safe and secure. 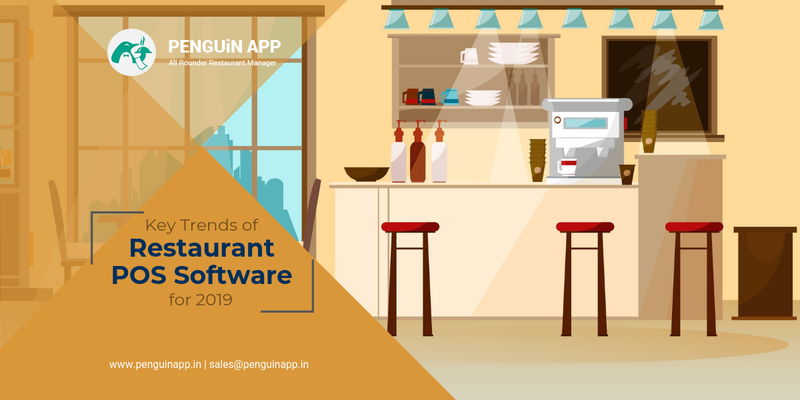 The best restaurant POS software will always help your business to run more productively and helps to manage all the primary functions like analytics, feedback, loyalty, CRM, etc. It will help your restaurant to handle things more systematically and instantly without many human interactions. Integrations will make your restaurant more functional and provides better ways to train the internal staff without any strong efforts. Above-defined is some of the top trends of restaurant POS software for 2019 which are going to escalate in the coming years. Technology is booming at a rapid pace making all the industries up-to-date with the essence of current trends. The level of restaurants is increasing with the adoption of restaurant POS software and making all the operations to get performed easily. This is the reason that more and more restaurant industries are adopting the restaurant POS software in their system for facing benefits both side, i.e. for restaurant owner as well as for the customers.